Reference number for this case: 24-25-Oct-54-Paimboeuf. Thank you for including this reference number in any correspondence with me regarding this case. "Surprised, legs shaking, wide eyes, he could not believe the reality. At least, he is adamant about it, no Martian trod our earth around the craft." "Suddenly, the saucer began to launch small green flames, making this part of the marsh already in the twilight of the day look sinister, and accompanied by a soft purr, it rose slowly, surrounded by a halo going through all the colors of the spectrum, and soon all disappeared on the horizon." The worker pedaled quickly to Saint-Viaud, and "at the nearest bistro, he stopped to recover from his emotions." The confirmation of his vision was made by a worker from the Kuhlman factories who, he, following the road Paimboeuf-Saint-Viaud, had seen the mysterious machine rise above the Gallégrais.A woman of the street Pierre-Jubau, later, also corroborates the fact. On some Sunday at the Profissais in Saint-Viaud, and these days, in the Gallégrais in Saint-Père-en Retz, two Martian visions occurred, and it does not take longer to trigger the round of the saucers in the sky of Paimboeuf. What will become of us if astral reconnaissance multiply in our airspace? But we can not doubt the testimony of this brave worker employed by a wine merchant, of calm and thoughtful mind, who, one evening, joining St-Père-en-Retz, followed the Paimboeuf-Saint-Viaud road and suddenly saw at the end of the marsh on the edge of the Gallégrais, a saucer resting on the grass at some distance. Surprised, legs shaking, wide eyes, he could not believe the reality. At least, he is adamant about it, no Martian trod our earth around the craft. Suddenly, the saucer began to launch small green flames, making this part of the marsh already in the twilight of the day look sinister, and accompanied by a soft purr, it rose slowly, surrounded by a halo going through all the colors of the spectrum, and soon all disappeared on the horizon. Pressing down the pedals, Louis was soon in Saint-Viaud. At the nearest pub, he stopped to recover from his emotions. The confirmation of his vision was given to him by a worker of the Kuhlman factory who was going along the Paimboeuf-Saint-Viaud road and had seen the mysterious craft rise above the Gallégrais. 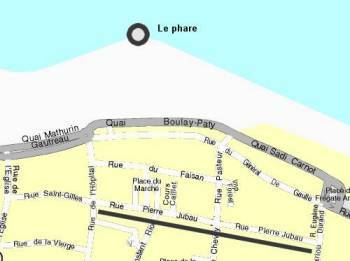 A woman in the Pierre-Jubau street later also corroborated the fact. Is it hallucination, mass psychosis? The thing is puzzling. Will we one day prove the materialization of these craft? The question is asked, let's wish for the peace of mind of the Paiboeuf residents that it does not stay unanswered too long. A workman employed at a wine merchant's, calm and sensible mind, whereas he was going to Saint-Père-en-Retz while following the railway from Paimboeuf to Saint-Viaud, saw suddenly, at the end of the marsh bordering La Gallégeais, a saucer posed in the grass, at some distance. Surprised, his legs shaking, eyes wide opened, he could not believe the reality. Suddenly, the saucer started to launch small green flames, making this already sinister part of the marsh even more sinister in the half-light of the finishing day. Accompanied by a soft humming, it rose slowly, surrounded by a halation passing by all the colors of the spectrum, and soon, all disappeared at the horizon. Confirmation of his sighting came from a workman of the Kulhman factories, who followed the road from Paimboeuf to Saint-Viaud, and had seen the mysterious machine rising above Le Gallégeais. A lady living Pierre-Juhau Street, thereafter, also corroborated the fact. The website indicates that on 24 October 1954 at 19:00 in the south of Paimboeuf, France, "Disc in marsh by railroad tracks. Glows. Rises, shoots away." And: "An object was sighted by multiple independent witnesses that had an appearance and aerobatic performance beyond the capability of known earthly aircraft. One disc was observed by three witnesses in a swamp for two minutes." I have searched for trivial causes of this sighting in the area. I found out that the Paimboeuf lighthouse might have been involved. Its geographical situation is at the end of the mole of Paimboeuf, the coordinates are 47°17'26'' N and 02°01'28'' W.
It consists of a cylindrical turret of masonry of 7 meters of total height and 2 meters 20 of average diameter. The fire of the headlight is 7 meters 60 above the ground level at that place and 13 meters 30 above sea level. The masonry is topped by a cupola with a gallery and an occultation screen. The masonry is of white color, the cupola is of green color. The headlight is extinct in May 1954, for lack of operational budget. It is relit on September 6, 1954, it produces 3 screenings every 12 seconds and its green and white light can be seen from a distance between 7 and 10 miles, depending on the transparency of the air. Paimboeuf. 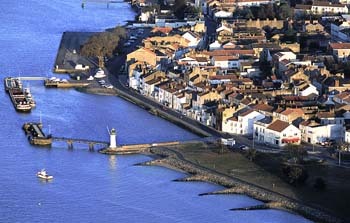 The lighthouse is visible at the end of the pier. In front of the black line, Pierre Jubau street (and not Pierre-Juhau) where a lady corroborated the fact. It should be possible to check whether the lighthouse, 7 meters above ground level, could be seen from this street. In theory, there was to be usually a screen so that the light does not disturb the residents; it must be supposed that on October 24 or 25, 1954, this screen was temporarily dismounted. 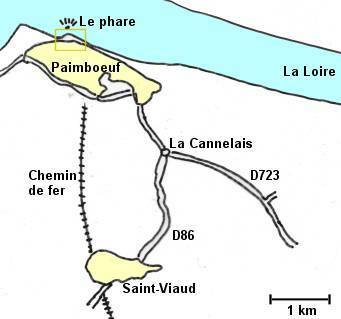 The account indicates that the first witness followed the railway between Paimboeuf and Saint-Viaud. As he wanted to reach Saint-Père en Retz which is in the South, he turned his back on the headlight, in theory. He could have looked behind anyway. The second witness, according to the account, followed the road from Paimboeuf to Saint-Viaud, and had seen the mysterious machine rising above "La Gallégeais." There is no place named "La Gallégeais" and I suspect that it was actually "La Cannelais." That being said, the "saucer" could also have been a meteor arriving from behind the horizon. 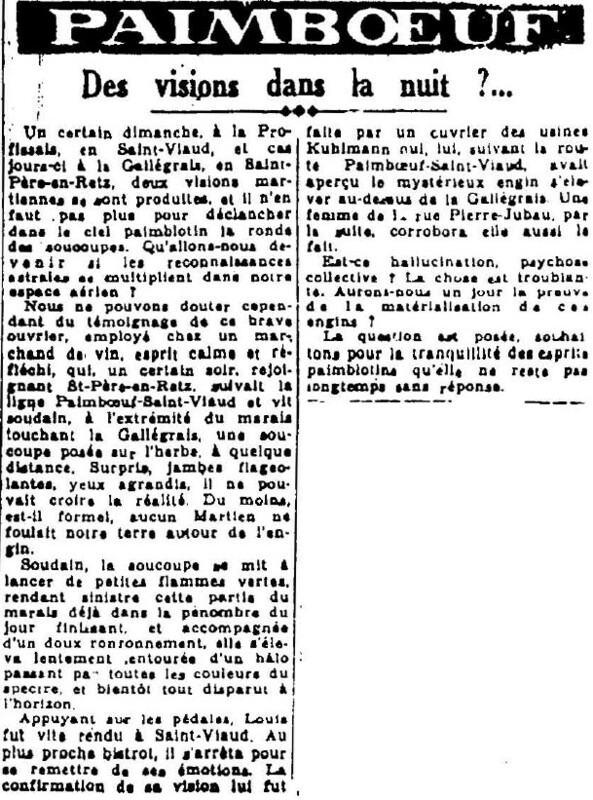 [ro1] Article in the regional newspaper La Résistance de l'Ouest, Nantes, France, page 4, October 27, 1954. [js1] "Le Dossier 1954 et l'Imposture Rationaliste", book by Jean Sider, Ramuel publisher, France, page 120, 1997. 1.0 Patrick Gross March 6, 2010 Conversion from HTML to XHTML Strict. First formal version. Addition [ud1]. 1.1 Patrick Gross September 18, 2014 Addition [ro1]. 1.2 Patrick Gross December 26, 2018 Addition [lh1].